Hello from Willmington, DE! 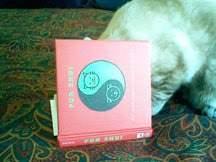 Both of Lisa's kitties have checked out Fur Shui. 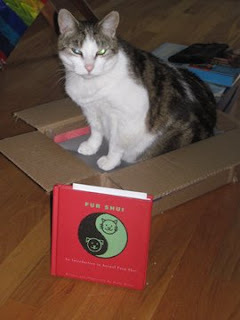 Toby (black kitty) likes to look at new things while relaxing on her comfy white (color of children and creativity) bed and Allie has jumped right into the Fur Shui box to explore all the energies that have traveled with the book. She agrees that the color grey is good to go...note the grey packaging board that she has placed in the box...happy trails to all by using grey the color of helpful people and travel! Big world out there, marvelous people, positive realities just waiting for us all! Peace and blessings Laura! 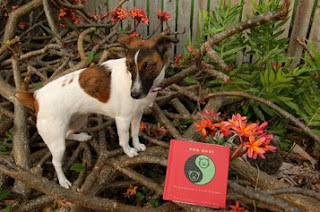 Two good buddies in Encinitas, CA., Roosevelt the cat and Saddie the dog are part of Nancy's fur folk family who have checked out Fur Shui! Saddie seems to have claimed the book being the official guard of Nancy's career gua. She is lending her love, energy and joy to the house, esp. the career, life path entrance way where she rests in wait to greet both of her people coming back from successful days at work...and Nancy landing that purrrfect position! I recently had a visitor to my place for a small bit of time while one of her people did some healing. 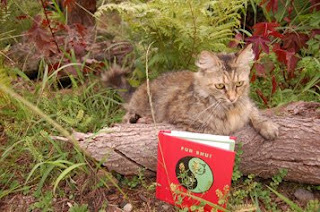 Bamboo cat came a long distance to take a quick read of Fur Shui! She decided to hang out in my prosperity gua (note the purple throw!) and gave my whole home a wonderful energetic boost after my dear cat Boomer passed. She is certainly a "healer" kitty with lots of amusing energy...Thanks Bamboo for showing me love, joy and living in the moment! Pam and her dog Shirley are quite the Fur Shui enthusiasts! Pam specializes in massage for her fur clients (Budda Dog Massage) and must spend lots of time in the Helpful People life space healing all she touches! All is caaaaaalmmmm in Woodland Hills, CA! 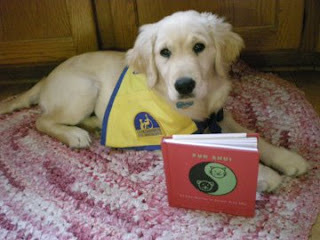 America the dog is in CCI training and taking Fur Shui "tools" with him to help and assist others! Great to train fur folks in the Skills and Knowledge gua and also the Family life space. We are all one big happy family for and in America. Thanks Ann for sharing your good work and America's good deads! Dixie cat is comfy in her tent in the Love / Relationship gua. 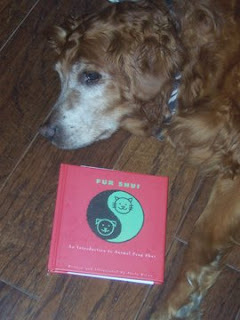 Here's what Julie in Beaverton, Ore. has to say about Dixie and Fur Shui...thanks Julie! 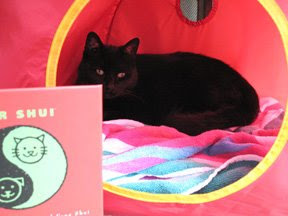 : The attached photo is my cat Dixie, in her tent! As it turns out, I had placed it in the Relationship corner of my bedroom, before I read your book! Dixie absolutely loves her tent, and "camping out"! Thanks for writing this book, Paula! It's great for us pet lovers!!! It's homework time for the fur folks in Laura's life. The Skills and Knowledge qua is the place to study in...find it in your home, I am sure your fur loves naturally know where it is. When is "recess" please!? There's lots of love here in Bobbi Jo's home. Rescuing all sorts of animals, loving and caring for those that need some TLC is what Bobbi does best. Here are a few of her "rescues" that just love her so deeply! Into Fur Shui in a big way!!!! Can't get enough of the "constructive cycles" that show energy cause and effect...gotta dig into the Earth and get rewarded with good health...Earth digging is good...Earth is the element of the health qua. Now, if only my person Becky can appreciate this! 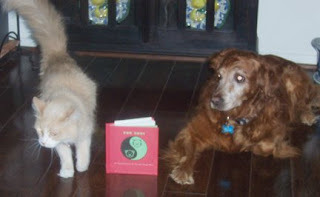 Thanks Denise for sending in Mr. Rico and Fur Shui! What a great educator he is. 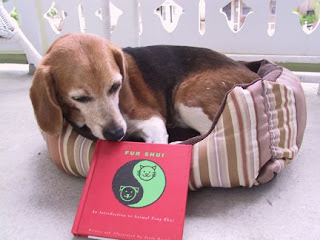 Here's Denise's story on Rico: "Fourteen-years-young Mr. Rico feels the red cover of your Fur Shui book represents his fame! 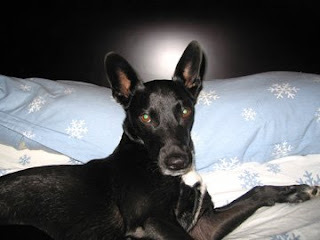 At age nine, he was tied to a table in Palm Desert when his human family divorced and didn't know what to do with him, but his luck turned around (or actually ours did) when he joined our family. 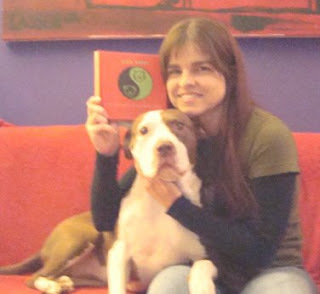 Rico became my "demo" dog and accompanied me on lectures and television show appearances demonstrating various Pet First-Aid skills. 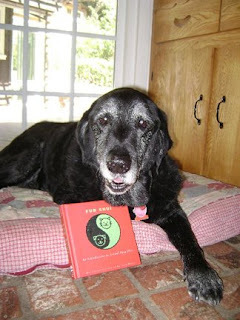 Now enjoying a life in retirement, Mr. Rico lays on his red bed gazing at the wall of his photos in various magazines and re-watching his appearances on "Lassie's Pet Vet" and other TV shows while he enjoys apples and lots of love from his family." Here's Mike, Shelley's fur love. So snuggled in with Fur Shui. He snoozes off to dreamland with thoughts of perfect health with Earth tones, Earth is the element of the Health qua! Caleb is a loving helpful dog that is in "service" to folks who need a little bit of extra TLC! Caleb has a nice blue kerchief telling you this...and a smart Fur Shui color to add to your animal for a boost in skills and knowledge...in this case, the skill is passing on love and Caleb is certainly skilled at sharing loving hugs and kisses! Just look how happy it makes Caleb! Neighbor to Fiona the cat in Noho...Twizzle is lecturing her person Mare about the importance of Balance and maintaining good health by adding some yellow to the center of her home...when you have your health and a balanced environment, you have it all! 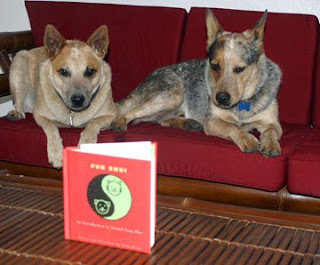 "Wow", this book really rocks!" says Fiona, neighbor cat to Mr. Jim. She is a very "coy" kitty, smart and always gets pampered like a princess...she is into the color pink and is lavished with lots of pets and love by all in her complex in North Hollywood. Big times in Burbank with "Biggy" and Fur Shui, relaxing before helping his person with productions up and down the coast. He is the "PA" for Lisa in Burbank! 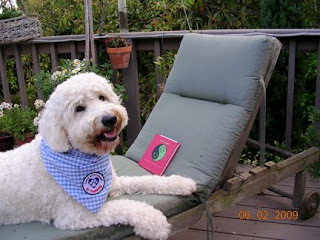 He has been reading all about boosting up the Creativity qua with the color white (note the white comfy pillow!) and just reminding his person to find the time to just go out and "play", find joy and all will flow! Hoooray for Hollywood! 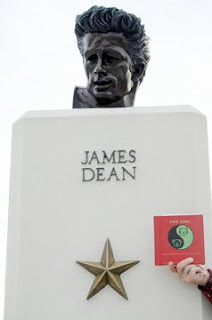 Fur Shui goes on the "Star Tour" and visits James Dean up at the Observatory. 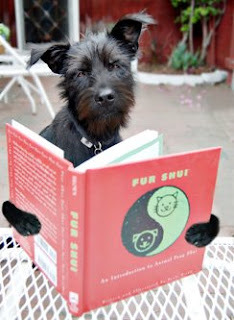 Thanks Jim for boosting Fur Shui's Fame Gua with the shot from LA! Aloha from Hawaii! I was recently on the beautiful big island of Hawaii, beautiful place and beautiful people! Swimming with the colorful fish and dolphins is a must for re-charging and slowing down to enjoy what is "real". Fur Shui went to Kukio Beach with the lovely Kehau...and her dog Pa'ani enjoyed Pink Plumeria and cat Queenie kept an eye open in the "wild", Mahalo Kehau! Greetings from the Tour de Fur! 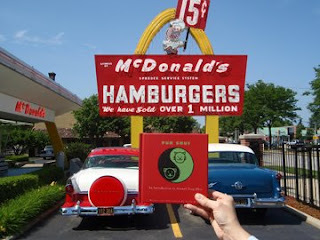 Karen from Chicago just sent in this cool photo of Fur Shui in front of Ray Kroc's original Mc Donalds...seems like the little red book has an appetite for history and burgers. 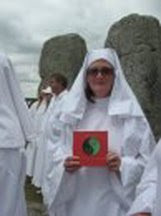 Here is Karen's note about the site: "Well, the city I am from, Des Plaines, IL, is not famous for very much. However, we do have one fairly historical site - McDonald's - of all things! This is the site of Ray Kroc's (the founder of McDonald's Corporation) first McDonald's drive in restaurant franchise established in April, 1955. It's located in downtown Des Plaines. Hamburgers were only 15 cents! He only had one "golden arch" back then. Not shown in the picture - the original drive-in building is in the lot with fake food and mannequins at the window to "take your order"." Thanks Karen! Welcome to the Tour de Fur...it is off and running around the world. Thanks for all the fun shots so far. 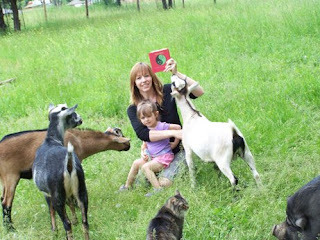 Folks with fur folks are enjoying the book. I honor ALL you out there with loves that have crossed over. 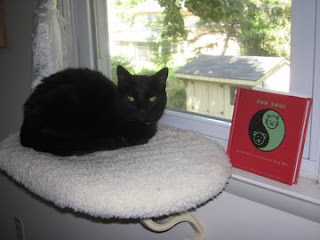 Myra's love Kabuki is participating "in spirit" as well as my own Boomer cat who just passed on. 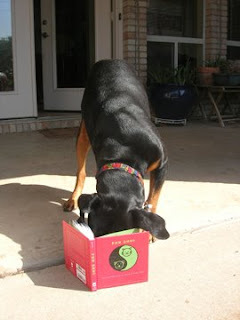 Say hello to Kabuki, she is now traveling with the book and making sure Myra's love is "passed along" as well. It really is all about how we are all connected by love and joy and passing it along. 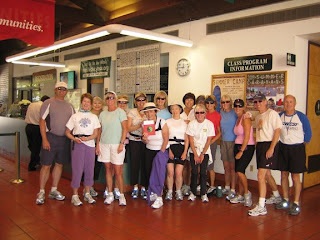 Fur Shui's Tour de Fur has hit the Encinitas "Y" speed walking group! Lots of fun to travel with fantastic and fit folks. Take a tip from Fur Shui and the helpful people / travel gua...strengthen your helpful people life space with putting a nice silver charm on your wrist as well as your fur folks collar or leash...could be an ID tag for both of you or a loving quote engraved on a charm that spells out your gratitude for your helpful "loves". This walk group just loves to travel, so they have SILVER reflective all over their shoes...a great boost for smooth travel and fun! Welcome to the Tour de Fur! Getting some pretty nice photos of you all and your fur folks...keep the book moving! 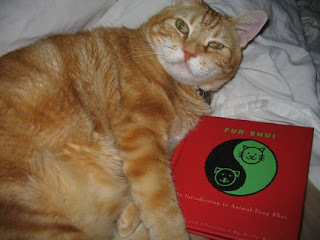 Since "Fur Shui" is traveling...here's a travel tip for your fur folks and you a la feng shui. Grey is the color of the Travel and helpful people gua, so be sure to deck out your pet's travel bag, flight container or just them with the color grey...grey or silver collar, leash or comfy grey blanket to snuggle in. Give them a boost with helpful energy with the color grey! 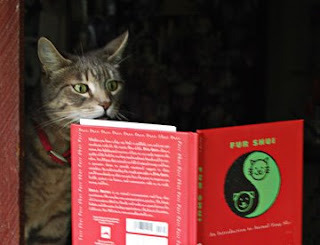 Here's the latest reader of Fur Shui! 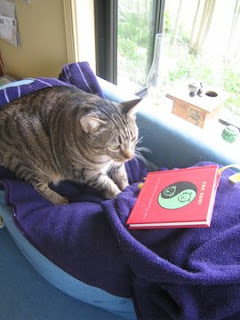 Paula C's cat Toby is very studious.